Researchers at a Canadian university have discovered a cheap and clean way to recycle tires. The recycling technology was invented by Costas Tzoganakis, a chemical engineering professor at the University of Waterloo, and was commercialized by Tyromer Inc. a green company that recently won a tech startup award from TiE50, which is TiE Silicon Valley’s premier annual awards program, for its clean tire recycling method. The recycled rubber process is chemical-free. This is quite the breakthrough because rubber is a material that cannot be entirely broken down, which makes it difficult to be reused. The reason is it is comprised of sulphur links that are difficult to dissolve without using chemicals. However, when chemicals are used to break down the material, they leave behind a permanent stench and a dangerous residue. Moreover, chemicals shorten the life of the rubber. The chemical method to make rubber reusable is used in China but the practice has been prohibited in North America and the European Union. Tzoganakis’s green technology uses liquid carbon dioxide instead of chemicals, which is injected into the rubber material. A process called devulcanization breaks down the links, returning the rubber to a malleable form, allowing it to be reused to make new tires or anything else. The rubber recycling technology may be a solution for the entire world. Being able to reuse rubber in such a way will have the greatest impact on tires, since 80% of all rubber is exclusively utilized to create new tires. Every year, billions of tires are manufactured and many of these tires will be discarded and tossed into landfills or stockpiled. However, scrap tires that are stockpiled are a fire hazard and it is illegal to dump tires in landfills. 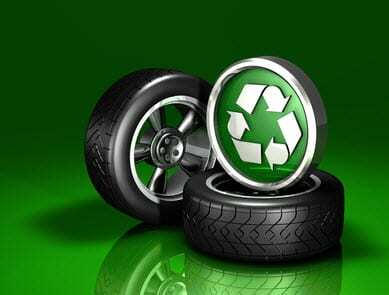 Thus, finding a way to safely and effectively recycle tires has become increasingly important. Now, with the new recycling technology from Tyromer Inc., rubber crumbs can be converted into reusable rubber. It is the company’s hope that within the year they will be able to develop a commercialized machine that will transform scrap tires into rubber that can be reused to make new tires, and sell these machines to companies who are interested in reducing their carbon footprint and who want a long-term return.